Thanks Amazon, we indies will take it from here! The Amazon vs. Hachette story is taking up a lot of space in the business pages of some big newspapers lately, especially my favorite, the New York Times, the only paper we sell at the store. I urge you to google the topic of Amazon and Hachette and read up on the situation. I think it is important for everyone to understand it, not just booksellers. In a nutshell, Amazon is using its market power to try to bully Hachette, a publisher, into obtaining cheaper prices and a bigger cut on the books and ebooks that Hachette sells to Amazon. Their negotiating strategy is to make Hachette's books practically unavailable to Amazon customers, in order to force Hachette to its knees. For a company that claims to value its customers above all else and to be negotiating on their behalf, their strategy is breathtakingly shortsighted. Great authors are being hurt now and will be hurt in the long run - making it likely some future classic is going to be left unwritten and that some wonderful literature that has already been published won't get the sales it deserves. Customers are being deprived of the books that they want to buy, and won't ever forget this betrayal by a company that has claimed to sell everything. Everything, apparently, but thousands of books from whichever publisher they're in negotiations with at the moment. Amazon has the gall to claim that they're only doing what all businesses do every day: make choices about what products they feature, which products get relegated to the bottom shelf, which products won't even make it into the store. How incredibly ironic that a retailer whose claim to fame is its ability to stock everything at all times - as they are completely unbound by physical limitations - is trying to act like a brick and mortar bookstore. What hypocritical, disingenuous claptrap. Sorry Amazon. You can't break all the rules and do your best to put every brick and mortar out of business and act callously towards publishers and authors - our lifeblood and our joy - and then pretend that you're just a retailer, that you're one of us. It's true that I do make choices and value judgments about what I stock in our store. I only have 3000 square feet and a limited amount of money available, and I have to decide what gets center stage. What I know for sure is that my decision not to feature a particular publisher's books makes absolutely no difference to them whatsoever, because there are hundreds of other independent stores that make different choices than I do. And, I have absolutely no ability to negotiate the terms on which I do business with those publishers. Neither can they buy my love. We only feature books that we want to feature, and you can be sure that we, unlike Amazon, aren't recommending a book to you simply because we've managed to squeeze a higher discount out of the publisher for it. Doing business with a bully has always been a risky proposition. The current situation is just a tiny little taste of how far Amazon is prepared to go and what they are willing to destroy in their attempts to dominate the book market. I guess we ought to be thankful they've shown their true colors while there is still an alternative: us. Read more about Thanks Amazon, we indies will take it from here! I am writing this at the McDonald Elementary School book fair, during a short lull in the action. After packing up 40 boxes of books and bringing them over and unloading them and organizing them on the tables (with the help of the library staff and volunteers!! ), we at BookPeople are a little tired, but in a really good way. I never get tired of seeing how excited the children are by bookfairs. Really the saying should be "Like a kid in a bookstore." They can hardly contain themselves, and spend a long time choosing exactly the right thing. Especially heartwarming is the child who cleans out his pockets for a book and then lets me know that the book is for their brother or sister. 20% of the sales at the bookfair are for the school. The school library ends up with a couple of really big boxes of new books for their collection - so everyone at the school benefits, not just the families who purchased books at the fair. One thing that is hard is tax. The youngest children don't understand that tax is added onto the cost of a book. The crestfallen look we get when something costs just a little more than what they have is so hard to see, that we've given up. We just take what they've got, and use the money from our tip jar at the store to cover the rest! Sometimes an adult who is nearby will cover the difference, and one way or another, everybody gets a little something from the book fair. We are so grateful to the Moscow School District for working with BookPeople of Moscow to do the bookfairs this year, and we look forward to another successful round of bookfairs next year. We hope we can go a bit further afield too, to do bookfairs at outlying communities and Pullman too! Read more about Yay for book fairs! Tonight, as part of Moscow First Thursday, book artist extraordinaire Timothy C. Ely, of Colfax, Washington, shared his art with us, and not only his art, but a little of what goes into his art and how he transforms thoughts into art. Tim creates incredible one-of-a-kind books completely by hand, drawing all the intricate sketches and paintings that form the book's pages, mixing the inks, adding whatever other magical bits of dust or bone or other secret ingredients are needed, then binds them by hand, with hand-tooled covers, into beautiful books. Each book is its own art show. The audience that attended was riveted and asked lots of great questions. Tim gave thoughtful answers. You could practically see the wheels turning in everyone's heads. I recognized several artists among the attendees and I know they appreciated the opportunity to discuss Tim's techniques and materials with him. There were younger people in the crowd too, who might have been surprised to learn, for one thing, how much mathematics is involved in the art that Tim creates. Tim, in turn, appreciated the opportunity to get out of his studio where he works in solitude, and share his work. I admit I sometimes grumble to myself when I'm hauling chairs around in the back of the store. We have lots of events and those chairs are not lightweight. But then the people come and everyone has a wonderful time. People are changed at these events, I know it, I can sense it. I can't quite put my finger on how to describe the difference between someone at the beginning of an event, and the same person after an event. Is there a physical manifestation of a mind that's been opened, ideas that have been planted, inspiration that flashed - pow - through the landscape of someone's mind? Even just the blossoming of admiration of someone's else's talent, nothing more, makes a person different and better. Maybe better enough not to grumble the next time she's setting up chairs. Thank you Timothy C. Ely! BookPeople has some exciting news for teachers all throughout the region. We have added a new section to our website called SchoolZone, where schools and teachers can have their own pages, listing books they would like their students to read. You can see the first page, set up for Mrs. Cowgill at Franklin Elementary in Pullman, here. In most instances we will be able to offer a discount on the books that a teacher recommends for students, and if we can deliver the books to the school, we can offer free shipping as well. Teachers can also set up an account on our website, and like anyone, can set up a wish list for their classroom that they can share via email. We can also post the wish list books on the webpage itself, making it easy for parents to purchase those books for their child's classroom. When our affiliate program is set up (hopefully by the end of the summer 2014), book purchases can also benefit the school. Stay tune for news about that, and the addition of on-line book fairs. January and February are quiet months in retail, on the sales side. After the rush of the holiday season, it is a real contrast. I'm not going to say it's a real "downer." Let's just say we miss everyone very much! Because it is quiet, customers will notice that our crew at the store is minimal and that I am not in the store a whole lot right now. I wanted to reassure you that while I am not at the store, I am still working. And because the work I am doing is a little repetitive and involves a lot of numbers, I am desperate for distraction. Lest customers believe I am off somewhere sipping mojitos on a beach, I feel the need to 1) write about what I am actually doing and thereby 2) give myself a break from the calculator and tax forms. It is a common misconception that running a bookstore or other small retail business is a sedate and rather relaxing career. But any small business owner will tell you that it's a never-ending challenge consisting of a 1000 different things: buying, selling, customer service, paying bills, figuring up and paying the taxes, counting the till, keeping the computer operating, building and maintaining a website, dealing with staffing issues and schedules, trying to keep the bathroom clean, handling special requests, planning special events, handing out donations, shoveling the snow, making decisions about every little thing...and spending an awful lot of time trying to find the best stuff to have for sale in the store itself. As I work on all of these things in solitude, I learn over and over again why being a small business is so emotionally rewarding and also why it is so hard. We don't have a customer service desk that is separate from the sales counter so we can send difficult customers and weird questions away. I don't have a central accounting office where I can send my receipts and bills and donation requests, I don't have an HR manager to run payroll for me. I don't have a buyer in Seattle or Arkansas deciding what we have in stock. I simply don't have the advantages of scale and centralization enjoyed by chain or big box stores. On the other hand, our store reflects the personality of our community as well as its owners, and offers the community merchandise, amenities, benefits, and service that you wouldn't dream of getting from a chain or big box. So I feel that while I'm absent from the store for a little while, I'm busily working behind the scenes to create value for you, and to continue to build community in the way that only the little locally-owned stores can do. Since there are unanswered emails in our inbox at the store, which will remain unanswered for another day or two, I wanted to post this blog entry written by another bookseller. It made me laugh because it is so true. It perfectly explains why emails do not always get answered as quickly as we all would hope. I also loved the way that although this bookstore blogger is in Vermont, the experiences are almost exactly the same as out here in Idaho. Teicher and the ABA Board stressed that Amazon’s practices are detrimental to the nation’s economy. Pointing to figures released by the Institute for Local Self-Reliance, they noted that every $10 million in spending that shifts from Main Street retailers to Amazon.com results in a net loss of 33 retail jobs. In 2012, Amazon’s sales increased by $13 billion. “That would mean … Amazon cost the U.S. economy almost 42,000 retail jobs just last year,” they wrote. All told, according to the Institute for Local Self-Reliance, every $10 million in spending that shifts from Main Street retailers to Amazonresults in a net loss of 33 retail jobs. That would mean for 2012 alone — using Amazon’s own numbers about its increase in sales — Amazon cost the U.S. economy almost 42,000 jobs just last year! Store Signage, or Why Don't You Have Any Signs? In the last month or so we've had two customers let us know in no uncertain terms their displeasure at our lack of signage in the store. If two people have been so frustrated, we know they are speaking for others who are, shall we say, less assertive. So here is an update on the signage situation. Permanent signage to identify sections in the store is an extremely big commitment. The design of it has to add to and not take away from the beauty of the store. It has to be visible but not intrusive or distracting. The cost of it has to be within our extremely tight budget. It has to be modifiable because sometimes the location of a section shifts depending on how much space it needs and where it fits best into the traffic flow of the store. While we have been considering the possibilities since day 1, we have not yet found the answer to all our needs. And, I have to be truthful: in Carol's list of priorities during the first year of store operation, signage took a back seat to other matters such as hiring and training staff, keeping books on the shelves and fulfilling special orders consistently and quickly, learning how to operate and maintain all our technology, launching our website, organizing successful events, and making sure we do things like file and pay our taxes, pay our bills, recycle our cardboard, and clean the bathroom. Old Harbor Books in Sitka, Alaska, where Carol used to work, never had section signage until recently because the longtime store manager preferred that visitors ask for help, and he knew that regular customers would learn the layout. It was a deliberate decision. While I have never intended the store to be without signage forever, I have trusted that in the meantime, customers in need of direction will know that when we say "Please let us know if we can help you find anything," we really mean it. We have also done our best to place books "face out" so without too much effort, customers can see, simply by looking at the books, what section they are in. Early in the summer, after rearranging some sections to their new and perhaps permanent locations, we began work on a store map that will be posted on the wall and also made into bookmarks. Our graphic designer is working on this and we are hoping to have the project complete by September 1. This map will not take the place of store signage but will hopefully be helpful, while we continue to work on the signage. Thanks for your patience with us, and we trust the end result will be worth the wait. Read more about Store Signage, or Why Don't You Have Any Signs? Today begins a special week here and all over the country, as we celebrate children and children's books of all kinds with multiple storytimes every day, and a special sale every day. As I scan the schedule organized by the amazing Jesica, our children's book buyer, I'm grateful for all the volunteers (lots of them teachers, but not all) who will be leading the storytimes, and for all the teachers and caregivers and parents who will be bringing their children to the store all week long. Why celebrate children's books? Our goal is to create lifelong readers. We hope that by providing memorable, happy moments related to reading books, the children who come to BookPeople of Moscow will turn to books again and again, day after day, for comfort, for fun, for inspiration, for delight, for escape, for entertainment...for the rest of their lives. I know there are lots of studies that prove the benefits of reading but the only evidence I really need is to be in the store every day and see over and over again that people who read a lot are very often people who know the secret of living well. 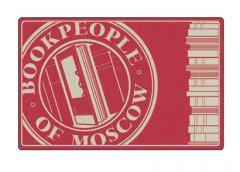 The children's book week schedule also reminds me that BookPeople of Moscow truly belongs to the community. To use a metaphor from one of our favorite children's books, Swallows and Amazons, it's like a very large sailing ship, and while the staff and owners are at the helm (or cleaning the head and swabbing the deck), everyone is crewing along with us, making sure the sails get unfurled. We hope you'll join us for Children's Book Week; the schedule is posted in full on our Events page. On a regular basis, something happens that makes me question my cavalier attitude towards the internet and having my identity out there in cyberspace. This week it was the discovery of a walmart.com charge to my credit card, which I knew beyond a doubt was not a charge that I had incurred. I never shop at Walmart, in person or online. So for the second time in a year, for the same reason, I've had to cancel my credit card and get in touch with all the places that I've used it for bill paying. What a pain. I order a lot of books for customers online, through lots of book dealers. Somewhere out there an unscrupulous employee at some book warehouse or clearinghouse wrote down my information and then tried to use it to go shopping. Or perhaps it was a more sophisticated hacking operation. We'll never know. So this afternoon I've been taking stock of the several websites that have my phone number, my mailing address, my credit card info... and doing my best to delete my information from them. I almost cancelled my Facebook account but didn't go quite that far - since it involves no financial information. Which all brings me back to how very much I value shopping at stores I know, whose owners live in the same town. Recent legislation passed in the Senate is now facing a battle in the House, legislation that would allow states to require online retailers to collect and remit sales tax from their customers in those states, just like bricks and mortar stores have to do. (Did you know that in Idaho you are supposed to report and pay the sales tax - yourself - that the online merchant neglected to collect on the state of Idaho's behalf? If I didn't collect and pay sales tax at BookPeople the State would have my hide, very quickly.) Anyway, this much-needed legislation has spawned discussion about convenience, fairness, marketplace ethics, and greed, and of course the big online retailers like eBay are fighting it tooth and nail. One letter to the editor in the New York Times noted that because of the tolls required to enter the city of New York, the writer intended to continue shopping online, which was more convenient in his opinion. He might rethink his idea of convenience when his credit card number gets stolen or hacked and he finds himself having to spend an entire day or two cleaning up the aftermath - and then waiting another week to 10 days before his new credit card arrives. And of course, when it comes down to daily life, I find it convenient to know so many of my fellow citizens that I see around town - seems like there is always some little piece of business that gets accomplished through a chance sidewalk meeting - that otherwise would have required an email or, ick, a phone call. I find it pretty convenient to have a conglomeration of shops in one concentrated downtown area ready to serve all my needs. I like knowing that if I should have some difficulty of some kind, there is an entire community of people who will rush to my aid, because we all know each other and do business with each other and support each other in various ways. That seems to me a lot more convenient than holing up at home waiting for the delivery guy to bring me some box. I'm all for technology and the benefits it provides us. But when it comes down to my money, I'm doing my best to keep it local, and real.